I did this kind of a test as well with nearly the same results. Important for the rf2-dlc is that all of the engines are competitive. I think they should. AJR: I do not see the suspension moving but only the wheels move up and down?? Formula Vee: I think this issue of the suspension not being visible in VR has already been said. But I have also noticed on replay the suspension does not move just the wheels. Curious which cars are you driving when the above occurs? What are your lap times at Sebring in a GTE? Have you tried the AJR at Virginia Full (Not the Grand Full but the outer Full)? If so, again I'm curious of your lap times. What is your AI Aggression setting set to? What is your AI Limiter Setting set to? I have set AI aggression at 0% or 30%,more it's a destruction derby . I race Imola 18 and Ibarra, Imola 72 is very annoying i can drive with a drink in my hand . If I have the time and the motivation, I will record a video from last (24) to first in a 24 min race (I think i can be first in 5/10 min). I don't know my lap times I have HUD off, but i know that the AI at 120% is not faster than me. The more I play with the rF2 Reiza bundle, the more I think AMS is better, and the on/off brake from the AI is annoying me so much....Congratz for Reiza studios, they have changed the awfull clouds from 1995 from S397....but not enough to fully enjoy, I really think that the move to rF2 is not a giant improvement, worst for some parts it's a step back (gearbox, AI). They dont really belong with european GT3 or Endurance series, even if theyre somewhat similar in performance. They race in brazilian series where tire options and indeed quality is more limited. They may not belong together but TBH, I think it's best to if we were to get more people to use these cars. Yeah, which is a creative license we adapt in our AMS releases (like making StockV8 sticker headlights actually work ). We are not doing the same in the rF2 release. .
Was this a slip? I know the conversation was regarding the puma but, "...creative license we adapt... (like making StockV8 sticker headlights actual work) We are not doing the same in the rF2 release. The StockV8s are coming to rF2? These cars are great. I read that differently to you, as in the AMS version has that but not any cars in rF2 that don't have headlights. No need to make a video. 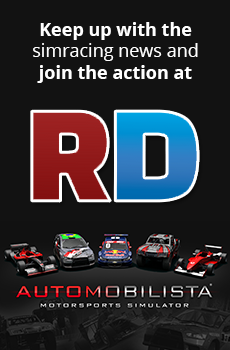 Run a few laps at Imola w/GTE and run a few laps at VIR w/AJR. Look at the leaderboard in the pit menu. Lap times are there. Just curious. I'd like to compare. I know my lap times at both tracks are consistent whether it's rF2, AMS or iRacing and I'm usually in the top 10 time per session against humans. Trying to determine how much of an alien you are. Do you run assists? Completely agree. In AMS there is a solid balance. Yes the Judd is the fastest, but they are all so close it really just falls down to what one fits your driving style IMO. If the engines are not well balanced than it defeats the purpose of offering multiple engine options as the only way to guarantee competitive close racing is going with only one of the engines. I agree completely. I thought the purpose of bringing the AJR, MR18, MCR2000 was because those paired well with our current content in rF2. I mean the AJR description even says it has LMP2 like performance. On top of that it would be nice to see the AI balanced better for it's pit strategies. Even if the tires are not as durable as say the Oreca on the AJR, their durability certainly isn't a huge issue from my use of them. The AI should easily make a full fuel stint on a set of tires, yet I see the AI pitting at least twice as frequently if not more than I personally do. That really makes it impossible to balance offline races with the AI, because you'll always be running far fewer pit stops than them. I experienced that same problem in PC2 and it made offline endurance races impossible. I'd love to see the AI pit logic improved on top of balancing the engine performance of the AJRs. at 02:05 until 02:25 you will have exactly the good example, AI is too much slow and brake with no reason and you overtake each lap the AI...even at 120% ! Half rF2 base/dlc content suffer the same problems reported here regarding AI/gearbox/turbo/etc. I replay AMS and OMG this gearbox ! I miss the missed shift ! And the AI don't brake with the on/off from rF2, it's so smooth ! I really love AMS ! I regret my purchase, the rF2 bundle is not at all on the same level than AMS ! rF2 has not the AMS quality, and I really hope the Reiza Studios will run away from this bugfest engine ! I will stay on AMS cause the rF2 bundle proves me why AMS is the king of the racing simulation! Lap time info would help. i.e. With an AJR (Forget which engine) I run 138.5s at VIR with a Baseline Setup absolutely no assists. Damage Multiplier 100, AI Strength 99%, AI Agression 29%, AI Limiter 0 (0 means the AI won't make mistakes). I read extensively on the best settings to make the AI competitive and this is what was suggested from the collective experience at the S397 Forums. I'm curious simply because if your laps are several seconds faster, amazing, then you are indeed an alien and of course will leave the field behind. If the lap times about the same but your AI are a mess and behaving odd, it indicates a setting may be incorrect causing the AI to act that way, which they will do using strange settings. rF2 is not as forgiving as AMS for less than optimal AI settings. Are you running Steering Assistance, Spin Control, Traction Control, ABS or any other assists? I've seen similar comments from others about the rF2 AI and nearly everytime, it's a setting. This isn't even your video ! Show the issue with your own driving so we can see a true alien at work But i do agree that the Ai are braking for no reason on t1 and 2 ! It's not only controllers that are unusable because of min steering lock being too high. Also (cheap) wheels like my logitech wingman with only 200 deg rotation. It is unplayable because steering is too jerky. Other cars and mods in rf2 can be adjusted well. Also cars in AMS don't have that problem. I noticed that too. I usually set steering lock to 14-15 degrees but with rF2 Reiza cars the minimum is 16 degrees, I'll have to double check but i could swear these cars can be set to less than 16 degrees in AMS, and iirc most cars I've tried in rF2 can have less than 16 degrees of steering lock. Also it seems that the default setup in rF2 is different from the different setup in AMS. I know what he meant. I was just being wishful. People disliking. How bad would it be if Reiza also did StockV8 for rF2? I understand that's their flagship car and will likely be part of their own release, which is great. People need to lighten up when it's due.